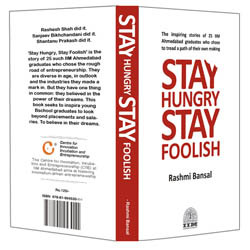 Stay Hungry Stay Foolish is published by CIIE at IIM Ahmedabad and written by Rashmi Bansal – an IIMA alumnus herself. In this book author profiles 25 successful entrepreneurs graduated from IIM – Ahmedabad. This is a really good read for people involved in start-ups or who want to start on their own. Learn from the stories of 25 successful entrepreneurs. People profiled in this book range from many businesses – Internet, Education, Pharma, IT, Non-Profit, Microfinance and few other domains as well. Every story is presented it in its own chapter and you can pickup whichever you want to read. Every chapter ends with few paragraphs of advice for young entrepreneurs from the person profiled in that chapter. This is what I liked the most in the book – quick words of wisdom for budding entrepreneurs from these successful entrepreneurs. Book is organized into three parts. People who knew entrepreneurship was the Chosen Path. They took the plunge straight after their MBA or after working barely a couple of years. And they persevered until they made it big! These entrepreneurs did not plan to take this path but when opportunity knocked they seized it. Their stories go to show that you don’t have to be ‘born with it’, you can develop an entrepreneurial bent of mind at any age. These individuals are using entrepreneurship to create social impact. Or as a platform which allows them creative expression. ‘Stay Hungry, Stay Foolish’ is the story of 25 such IIM Ahmedabad graduates who chose the rough road of entrepreneurship. They are diverse in age, in outlook and the industries they made a mark in. But they have one thing in common: they believed in their dreams. This book seeks to inspire young graduates to look beyond placements and salaries. To believe in their dreams. With an amazing price as low as 125 Rupees, its worth the investment – both the money and time you spend reading. Anyone with an interest to start something on their own will find this book very inspiring. There is less business jargon, rather book is full of simple words of wisdom and lessons these people have learned while building their businesses. Read it and get inspired!